HP M8505 5.25" externe backupdrive kopen? | That's IT! Gebruikte, maar in perfecte staat verkerende StorageWorks 400/800GB LTO-3 backupdrive (Ultrium 3). Deze drive is een extern model in zwarte HP-behuizing. Wordt bulk in antistatische verpakking geleverd. The M8505 tabletop tape drive provides direct Fibre Channel connectivity to HP NonStop Integrity NS-Series servers with manual operation in a tabletop configuration. The M8505 tape drive significantly lowers the cost for an entry-level tape drive on Integrity NonStop NS-Series servers while greatly increasing both its capacity and performance. 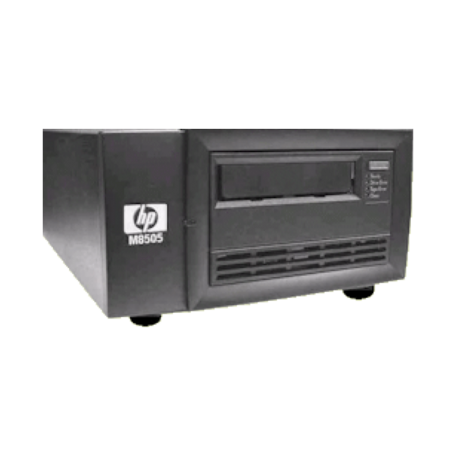 The M8505 tape drive requires the minimum release of H06.04 for HP NonStop Integrity NS-Series servers. The tape drive can also be connected to an HP NonStop S-Series server through an IOAME with Fibre Channel ServerNet Adapter (FCSA) fibre channel ports.